Se estiver em Azuna e tiver de cumprir a missão mundial, vá até o "Olho D'Água de Nor'danil, após a segunda piscina você verá um caminho que sobe a encosta, é só subir. For the one in northwest Suramar, go to southern highmountain, under the word "riverbend" on the map specifically the R is a little path south across the river, you'll pass an elite hill ettin, go into valsharah for a second on the "high road" then into suramar, keep following path and you'll get there. Another way I found, continue down river from riverbend, fall down waterfall once, before the 2nd water fall there is a path to the right and he's there. The Azsuna path (in my case) starts at 39.1, 32.8. It is a very steep upward path. The Brimstone Destroyer is an elite, so I needed another player to help. This was strange. 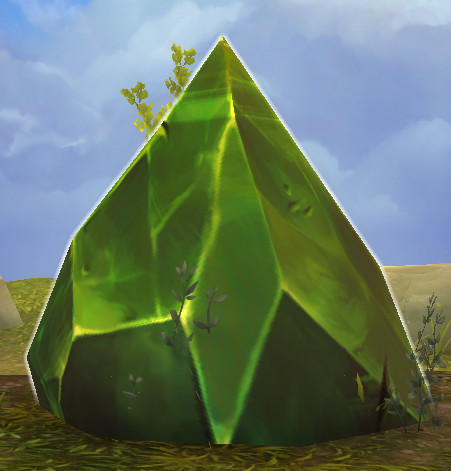 The ONLY thing I had to do in Val'Sharah was to mine a Huge Green Crystal at 49,55. I did not have to fight anyone.